Vienna. Home to world-famous composers, philosophers, architects – and cakes. When visiting this enchanting city, Hotel Sacher is our go-to. Inventor of Sachertorte and host to celebrities and Royals alike, this iconic hotel is a master-class in elegance and high class comfort. From the red damask dining room of Restaurant Rote Bar to the 149 rooms and suites, everything at Hotel Sacher is done with that sense of panache that the Viennese are so renowned for. Hotel Sacher lies at the heart of Vienna in every sense: geographically, culturally and historically. You need only step out the door to find yourself in the heart of the city. In fact, you need only look out the window to see one of the city’s most famous sights; The Opera House. The hotel’s central location also means that it’s just a quick 30 minute drive from Vienna International Airport. 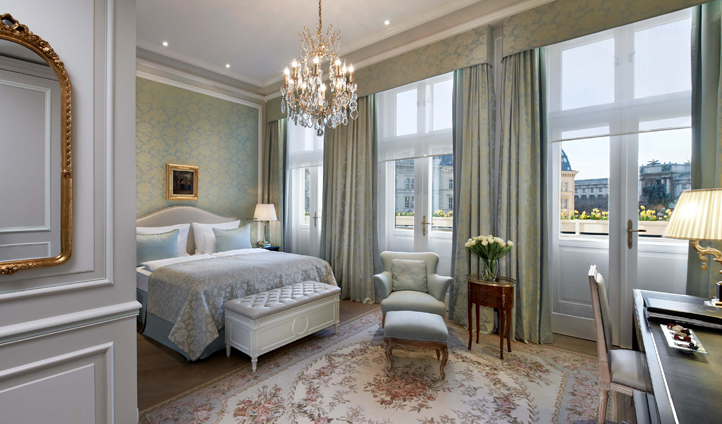 Each of the 149 rooms and suites at Hotel Sacher are a celebration of Vienna’s rich, cultural past. The elegant belle époque influence gives a sense of the grand tradition that epitomises this hotel, whilst collectable art and antique furniture ensure that each room is entirely bespoke. Seamlessly juxtaposing tradition with modernity, rooms also feature all of the cutting edge technology that the modern traveller would expect. Think, mirrors that magically transform into TVs, underfloor heating in the marble bathrooms and you’re on the right track. 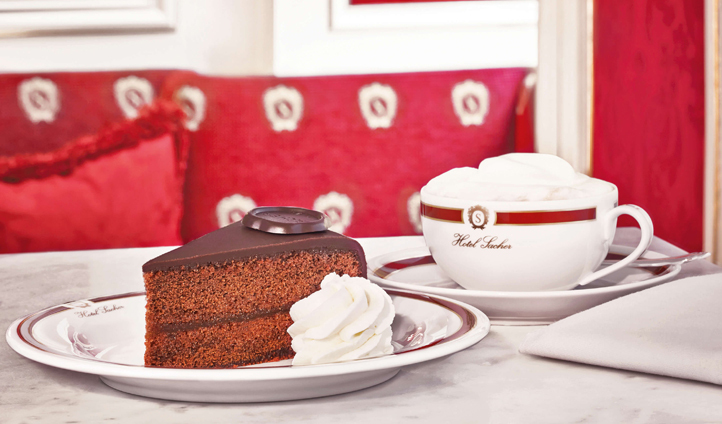 It would be very easy to come here for a slice of the divine Sachertorte alone – the recipe for which is a closely guarded secret. But Hotel Sacher has so much more to offer. The two hotel restaurants are a long way from Schnitzel and Gluhwein and we absolutely loved the ‘Back in Time’ menu at Restaurant Anna Sacher. Meanwhile, the dark blue brocade decor of The Blaue Bar makes it the perfect spot for an aperitif before nipping across the road to the opera. When you feel like in need of a break from your cultural escapades, head to the Sacher Boutique Spa where, for chocoholics, their signature chocolate treatments are a dream come true.